The state announcement on April 1 to set up the Xiongan New Area, about 100 km south of Beijing, came after years of research and thinking by the Communist Party of China (CPC) Central Committee. It is also a major strategic decision that will open a new era of development in the region, which spans three counties in north China's Hebei Province—Xiongxian, Rongcheng and Anxin—with an eventual area of 2,000 square km and a population of 2 to 2.5 million. President Xi Jinping drew an analogy between the legend of Chinese hero Dayu, who contained floods by having riverbeds dredged so that they could hold more water rather than creating flood barriers, and clearing unnecessary functions from the capital Beijing so that business could operate with greater efficiency. "The capital's core functions should be preserved and strengthened, and some inappropriate functions adjusted and weakened," Xi said. "Some operations should be transferred to Hebei and Tianjin." Addressing a central economic meeting at the end of 2014, Xi, who is also General Secretary of the CPC Central Committee, said transferring Beijing's non-capital functions, lowering its population density and promoting economic and social development commensurate with its population and resources must be at the core of the Beijing-Tianjin-Hebei region's coordinated development. During CPC meetings in April 2015, he suggested exploring the possibility of a new city in Hebei, built according to new development concepts. On March 24, 2016, a report was given to the president on the creation of a "subsidiary center" for Beijing and an area where non-capital functions would be relocated from the capital. The subsidiary center will be located in the eastern suburb of Tongzhou while Xiongan is the other area. Xi stressed that Beijing is at a historic juncture. Tongzhou and Xiongan will form two "wings" of the city and create new growth engines for the Beijing-Tianjin-Hebei region. On May 27, 2016, Xiongan appeared for the first time in a report reviewed at a meeting of the Political Bureau of the CPC Central Committee. Calling it a "major historic and strategic decision" that would be "crucial for the millennium to come," Xi said the subsidiary center of Beijing and Xiongan would stand the test of history and be the legacy of this generation of CPC members. People will see Xiongan, the Pudong New Area in Shanghai and the Shenzhen Special Economic Zone in Guangdong Province forming a ladder from north to south across the map of China to act as testbeds for China's reform and opening up. These areas are expected to work together to balance the country's development and change its make-up, which features a strong economy in the south and weaker economic development in the north. It took some time to choose the location for an ideal new city. The process began in February 2015, with the final proposal deliberated and agreed upon by the Standing Committee of the CPC Central Committee's Political Bureau on March 24, 2016. Xiongan sits at the center of a triangular area with Beijing, Tianjin and Hebei's capital Shijiazhuang at the apexes. With good road and rail access, Xiongan commuters will be able to reach any of the three cities in about 30 minutes. The site is only 55 km from Beijing's new airport. Besides, it has a pleasant environment with a relatively low degree of urbanization. Less than 100,000 people currently live in the core area, about the same as in a regular residential community in Beijing. 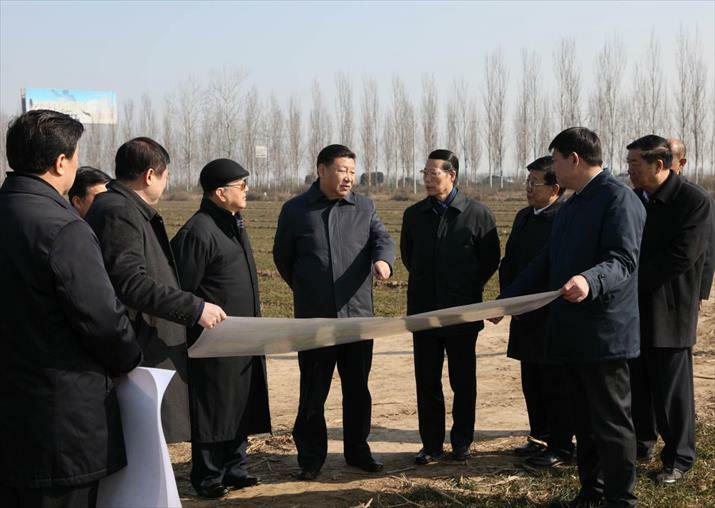 Visiting the area on February 23, Xi expressed satisfaction with the location, population and natural resources. "It's a good choice, as it will not create too much trouble for locals, involves only minor relocation and can be achieved in a short time," he said. Xiongan will primarily host non-capital functions from Beijing. Some administrative and public institutions, company headquarters, financial institutions, higher education institutions and sci-tech units will be transferred to the new area. During his visit, Xi called for "world vision, international standards, Chinese characteristics and high goals" in the planning and construction of the new area. The plan is for an optimal urban layout, public services and innovative development. 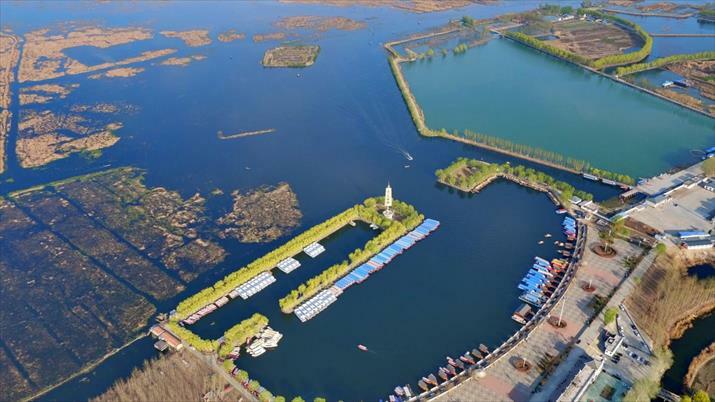 Eco-protection gets priority in construction since Xiongan is home to the Baiyangdian area, one of the largest freshwater wetlands in north China. Urban design is another keyword. "Every inch of land should be clearly planned before any construction begins," Xi said during the meetings. Renowned planners and architects from home and abroad will design Xiongan. It is expected that with a free hand to improve public services, provide better public resources and advance reforms in fields including household registration, investment, trade and city management, Xiongan will attract the best talent. In preparation, purchases and projects related to land and property and changes to household registration have been blocked in the three counties since June last year. The local authorities are on high alert against illegal land and housing purchases or construction to guard against speculation. A major transportation network and basic infrastructure are planned to be in place in Xiongan by 2020 so that the area will be well connected to Beijing, Tianjin and Hebei by 2022, when the Winter Olympic Games are held.